If competitors didn't already know that the AP flag signaled postponement, its lack of movement on the flagpole would have been a good indicator. Racing was scheduled to start at noon, but winds were too light to reach the minimum speeds that the competitors would need to keep their kites in the air until around 2:00 PM. With winds finally shifting between five and seven kts, the Organizing Authority decided that the hydrofoil class should take to the water first. 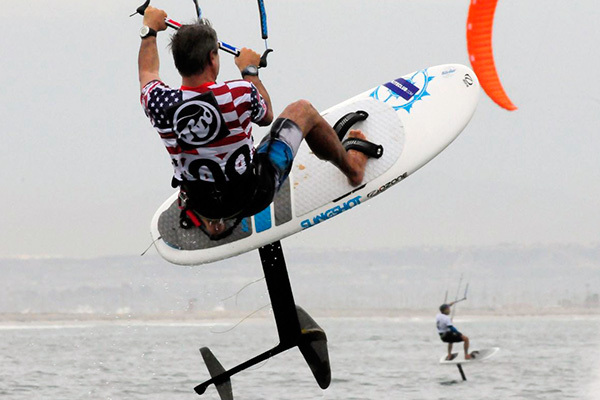 Hydrofoil Kiteboards need an average of at least 6 kts, while kite boarders need at least eight kts. Although those speeds are considered the bare minimums for both classes, many of the competitors have little to no experience competing in such light winds. Just in case the entry list featuring some of the top names in the sport wasn't competitive enough, weather and racing conditions gave the regatta an entirely new challenge. After making it past some relatively high breaking waves, the foil fleet was ready to begin the first race of the day. Sixteen racers began the first race, but only seven were able to cross the finish line. Racers were facing challenges from all directions, with light winds above and patches of kelp below. "That kelp was just deadly," said foiler Ariel Poler when he came into the shore. "The wind was so light, but the kelp was the trickiest part." Half of the foil board fleet came back to shore after the first race, while the remaining eight stayed out on the water for what would be the second and final race of the day. Everyone who started the second race was able to finish, giving their scores a large boost. Oliver Bridge's decision to stay for the second race paid off well with a first place finish. Even after not completing the first race, Bridge's end of day position was fifth. 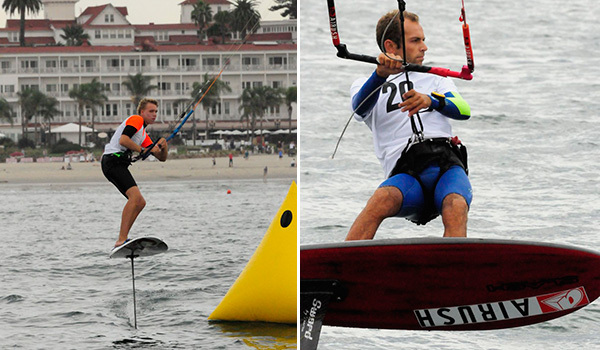 Home water advantage proved to be true, with San Diegans Nico Landauer and Bryan Lake who competed in both races and finished in first and second place overall. The previously light breeze quickly died after the second race, and at 3:45 PM the Organizing Authority decided to postpone all further races until Wednesday. The kiteboard class has yet to race. Competitors and spectators alike are hoping that Wednesday will bring bigger breeze and more favorable racing conditions. Results will be updated at www.sdyc.org/results14/kiteboardna_res.htm and depending on weather, Wednesday's racing is tentatively scheduled to begin at 12:00 PM.